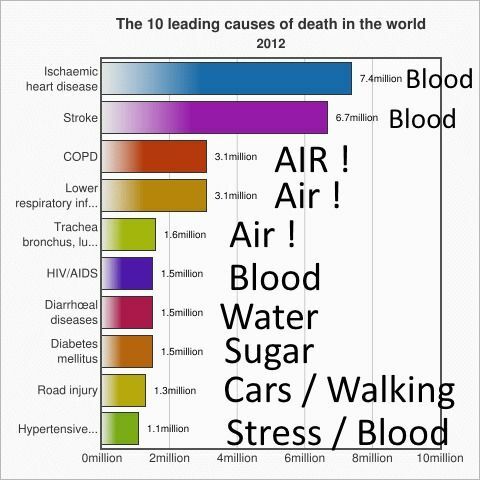 I was researching water borne diseases, when I came upon a WHO: World Health Organization report on the 10 leading causes of death on the planet. Clean air is more important than clean water in my opinion. Water is a problem, but I worry more about bad food, and how the dishes I am eating from were cleaned. I can drink clean water easily, to make sure the restaurant cleans, and dries the dishes I am eating from is out of control, the only solution is to always cook in the Hotel room. Contrary to some mystical the whole world is the same as the USA, restaurants clean dished abroad in polluted water, not the purified water we drink abroad. I can go days with out food, water, but only 3-10 minutes without air. Maybe in the future there is an air cleaner install on every window of the house, like a window air conditioner, these devices could control the air that enters and leaves the house. Air Conditioning is often extremely unhealthy air, often recirculating the same air, and with new air tight homes, or concrete, double insulated vacuum windows, there is often almost no ingress / egress of air, all the paths are restricted, we must open the air to breath. Where is air breathing paradise? I sell these bug baggers on Amazon. What I do with my rooms is this, there are screens on the windows, so not many bugs, but there are many too small to see bugs, or debris in the air, and if I allow the fan to run for 3-10 days, the bug bagger slowly cleans all the air. A simple way I can carry a clean air machine, both for bugs, and as you can see charcoal soot. This bug bagger is the alternative to spraying the room with insecticides to stop the no see ums, midges, etc. My old man died from COPD last year, although he had completely stopped smoking when he turned 50. Strange because he died 35 years later, at 85, so in old age he paid the conséquences of his two packs a cigarette a day when he was young. He suffered so much he begged his wife to bring him to a Swiss clinic to be euthanized, his wife (not my mom)categorically refused. Everyone should have a copy of Final Exit in their library.